The Life Fitness T3 treadmill is the most basic treadmill in the company’s premiere T-series. And as expected, this one is also the cheapest. However, although it is more affordable than most from this brand, it is still a bit overpriced when you consider what other brands in this price range is offering. If you’re the brand conscious type of person who only wants treadmills from a company you know and trust, then this model is for you. This is one of the most basic (and cheap) models in the T-series so it would fit beginner and intermediate runners. But if you’re a serious runner, I wouldn’t recommend this model. I suggest you visit our best buy treadmills page and look for other treadmills in this price range.. 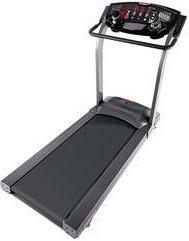 This treadmill boasts a 2.5HP continuous duty motor that has a max speed of 10mph and a max incline of 15%. This motor is perfect for both beginners and intermediate runners who want intense workouts. The 20” x 54” running surface has enough room for you to move comfortably. It is ideal for both walking and running. This deck also comes with FlexDeck Shock Absorption System that reduces stress on your joints while running to help prevent injuries. The Life Fitness T3 treadmill also features 7 pre-programmed workouts (Hill, Random, Manual, Sport Training, 5K Sport Training, 10K Sport Training, EZ Incline™) to give you more variety in your workouts. Plus, you’ll get programming capabilities and a QuickStart function to provide flexibility. Other features include a 10-character LED readout which shows you basic information regarding your run, an intuitive console that is very user friendly, and a reading rack and an accessory tray to place your magazines and sports bottles. Like most Life Fitness, this model’s biggest weakness that it is overpriced. When you’re buying a Life Fitness treadmill, expect it to cost more because you are paying for the brand name rather than the product. To conclude, I believe that there are other treadmills out there with the same price tag that can give you more value for your money (Visit our best buy treadmills page). So I would not recommend the Life Fitness T3 treadmill. If you plan on buying a Life Fitness T3 treadmill, I suggest you buy it at lifefitness.com. They offer the best price around the net. You can get it for just $2,399.